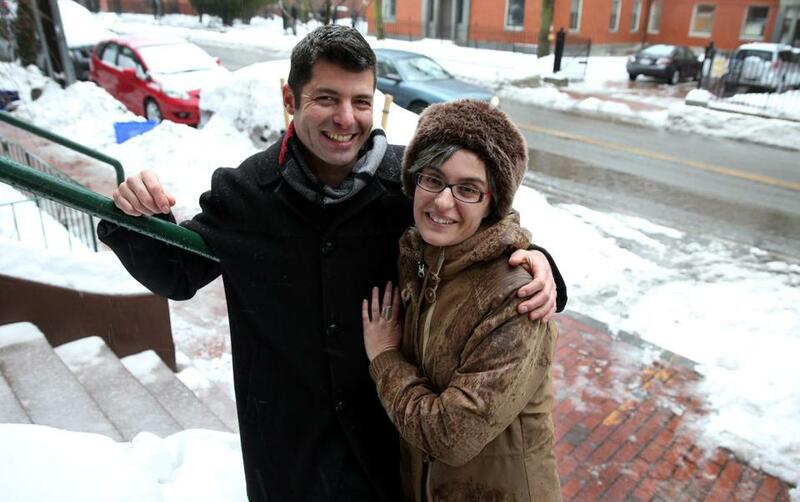 For Brad Verter and Clementine Feau, parking rules have proved vexing. After two years of dating his girlfriend, Brad Verter of Brookline expected some pressure to take the next step and move into her Cambridge apartment. But he never expected the prodding would come from the Cambridge Traffic, Parking, & Transportation Department — the agency that slapped him with six parking tickets in two weeks for overusing his girlfriend’s visitor parking permit so he could stay overnight. For Verter and other out-of-towners lucky enough in love to find their better half within the city limits of Cambridge and Somerville, the pleasures of blooming romance can be tempered by a more vexing experience: racking up hundreds of dollars in tickets for excessive use of a partner’s visitor parking permit. The passes allow guests to park temporarily in a spot designated for residents. But if the permits are used too frequently, the tickets are costly, and appeals are rarely won. The situations also raise some privacy issues: To identify overusers, the cities maintain months or years of records on the length and frequency of domestic visits. For many couples, receiving citations for visitor parking “overuse” has become a benchmark in a budding relationship. Forget declarations of love on Valentine’s Day or quandaries about leaving a toothbrush in a partner’s bathroom or requesting an empty drawer. The real evidence that things have gotten serious appears under the windshield wiper. “The tickets were one of the bigger things when it came to thinking about our relationship,” said Danielle, a former Melrose resident who did not want her last name used, to protect her girlfriend’s privacy. In Somerville, residents can pay $10 for a two-day visitor pass and $40 for a three-day pass. The rules are spelled out: Visitors may not use the pass for more than two or three days of the week, though Sundays are free parking days. Verter, 48, argues he never had a chance to avoid getting ticketed because the Cambridge rules don’t specify how many days per week he can visit. Over summer, Verter racked up $180 in tickets, which ballooned to $600 when he refused to pay and his car got booted. Phone calls, letters, and e-mails to the traffic department, trips to City Hall, and a formal appeal yielded no dispensation, nor a clarification on how much is too much when it comes to visitor parking, he said. Verter said his girlfriend, Clementine Feau, has been threatened with having her parking permit revoked. Susan Clippinger, director of the Traffic, Parking, & Transportation Department, acknowledged Verter’s concerns, and admits the department uses its discretion when it comes to visitor permits. “It’s a hell of a lot of work because there are so many individual circumstances that households face,” she said. The department recognizes some exceptions — for nannies, for home health care workers, or short-term visits from family — but city officials balk at creating a more rigid policy. “It’s not something that lends itself to a black-and-white circumstances kind of thing,” Clippinger said. Residents can be hyper-vigilant about defending against visitor parking pass abuse. Clippinger frequently receives phone calls from suspicious neighbors when they see the same car with a visitor pass appear on a near-daily basis. That’s why she encourages frequent visitors, including Verter, to just bite the bullet and declare themselves residents of Cambridge. It’s a paperwork hassle, she acknowledges — Cambridge rules require a change in a vehicle’s registration address and multiple proofs of residency — but if a person’s car is parked mostly in Cambridge, it’s the best way to avoid more tickets. Verter maintained he obeyed the parking pass’s only explicit rule: that he cannot use it for three consecutive days. He said he knows he never broke the rules, because when he complained about his six parking tickets, he was provided with a log — listing all 59 occasions in the previous year that he had spent the night at his girlfriend’s house. Kade Crockford of the American Civil Liberties Union of Massachusetts said parking tickets could be subject to public records laws, allowing anyone to access the time stamps. For Danielle, the tickets she racked up were a major nuisance as she and her girlfriend spent more time together. But it was also kind of a bonding experience, the 26-year-old acknowledged. The pair strategized about the best time to park: midnight on Thursday, so the car could be undisturbed for two full days, then a bonus day on Sunday, when parking is unregulated. Danielle’s girlfriend reminded her when it was time to move the car to a metered spot, and sometimes she’d venture out into the early-morning chill to complete the task herself. Still, there were slip-ups, and after Danielle accrued more than $200 in tickets, they decided that something needed to give. Maybe, they concluded, it was time for Danielle to become an official resident. But Verter isn’t giving up so easily: For him, it’s the principle of the thing.